This year I decided to try community sponsored agriculture (CSA). I like the idea of supporting the local economy. I have been shopping at the Alachua County Farmer’s Market on Saturday mornings since we moved here. After doing research I decided to try the CSA program through Graham Farms. 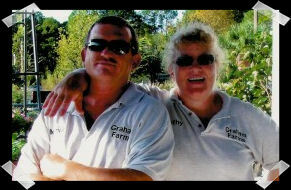 Graham Farms is a family operation run by Marvin and Kathy Graham. I first became acquainted with Marvin and Kathy through the county farmers market. One of the things I liked about the Graham’s operation is that they are pesticide free. One of the reasons I prefer to buy produce through the farmer’s market is that I can get to know the farmers and learn which ones are pesticide free. Affordability and flexibility were the deciding factors in selecting Graham Farms CSA over other available options. Most of the programs I found required a buy-in of several hundred dollars and ran for limited period. In many CSA programs you buy a weekly share and get a pre-packaged selection of produce. Graham Farms has two CSA programs the Market CSA & the UF/Gator CSA. The Market CSA (the one we joined) has a year round open enrollment. The minimum share purchase is $100 and is good for one year from date of purchase. As a bonus they give 10% bonus dol­lars towards your share. The cool part is that they send out a weekly email and allow me to select what items I want for the week. If you are looking for a CSA program in the Gainesville, Florida area I would certainly recommend checking out the program through Graham Farms. Oh, be sure to tell them that Dee sent you there way.